And do you have another name we can call you by to save calling you SwanCullen? I'm Elise, I'm one of the OC (Original Crew) and CC (Crazy Crew, led by Shannon (Skylarblue))and am also the EDC Cheer Squad Captain. If you would like to join that squad just shoot me a PM and I'd be happy to let you join us. Umm I'm pretty sure Carrie (urcoolcarrie) has to officially welcome you to the Crew, she's in charge of promotions and ranks etc but I haven't been on here in so long and I don't think she has either that you can jump straight in with the conversation. Shannon, who I mentioned earlier, is our Trainee Supervisor so if you have any questions or queries shoot her a PM. BHG is our Mod and big chief here but I have no idea where she is. Actually I have no idea where anyone is, I hadn't been on here in about 7 or 8 months so I can't talk..Butttttt...Hopefully everyone will eventually come back and grace this wonderful thread with their presence. Until then enjoy the quiet life around here..
Why do you think Emmett was so ready for Bella to become a vamp? Oh and Ted..HOW COULD I EVER FORGET YOU!?! -Gasp- So many members are back! I haven't seen a lot of you in AGES. Elise, Ted, everyone! <3 I know it sounds silly but seeing this place go back to the way it used to be is making me so excited. xD What can I say? I love the EDC. Okay, it's been a while so, question time. If Emmett wasn't with Rose, who do you see he could be with in the Twilight world? I thought Lauren at first as well, but I don't know, she seems a little bit too mean for him. Personally, I always thought that one thing Emmett always saw in Rose when the others couldn't, was her kindness. He knew that behind the mask, she had a gentle heart despite it all. And Lauren, well... I'm not so sure. But that's just me. What is your favorite Book for Emmettness? What would Emmett's favorites movie be? I loved the 'Madagascar' answer. xD But hmm, I think he would be more of a Comedy-or-Action type. I can see him liking movies similar to (but maybe not specifically) The Hangover, and V for Vendetta. But I could be biased because I <3 V.
WELCOME, WELCOME, WELCOME! FROM ALL OF US TO YOU! WE HOPE YOU HAVE FUN, WORKING ON OUR CREW!!! But anyway, welcome and if you need anything (if you have questions, comments, or just want to talk) feel free to PM me, and if it's EDC specific then just like Elise said, talk to Shannon. We're all here to help you get adjusted and have a blast! I agree with everything Bri said, so I'll just go back into my old habit of repeating everything in different wording Just kidding, I'll try and be somewhat original for the sake of setting a good example hehe well Emmett liked Bella from the very beginning and has always been amused by her so he would be all for having her as a part of the family, and like Bri mentioned coming from a big family "the more the merrier" was probably his mentality. He would want Bella to be safe (like she would be as a vamp) and he would want both Edward and Bella to be happy and together forever like they were meant to be. And this is more of a minor reason, but he knew Bella would be powerful as a vampire since she was already powerful as a human, and that would help protect Rose and the rest of the family. 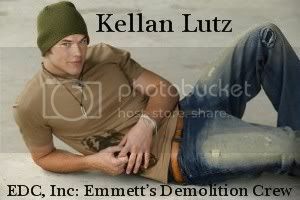 And it would maybe give him an excuse to fight Emmett being Emmett, he would be all for that too. Everything else I can think of Bri already said; he knew Bella was ready etc. And yes Bri, your post made perfect sense! I'm impressed you write that legibly at 5am, and just out of curiosity, what were you doing up at 5am anyway? I'm off to the wonderful land of homework and M&M's (I've found the two balance each other out) toodle-oo! Hey everyone. I agree I am also excited about this place being back in business! Ted: I had to welcome my twinny back! Elise: You haven't been on here in like FOREVER! Emmett isn't mentioned much in the books (sadly), so what part of the book do you think Emmett should have been in more? Ooh, speaking of, happy Friday the 13th, everyone! I'm personally not superstitious but for those who are... -Hands out four leaf clovers and horse shoes to all- Even if you aren't superstitious either, four leaf clovers are pretty and you could always donate the horse shoes to a poor pony in need. And I wanted to Emmett wrestle an anaconda in Breaking Dawn! 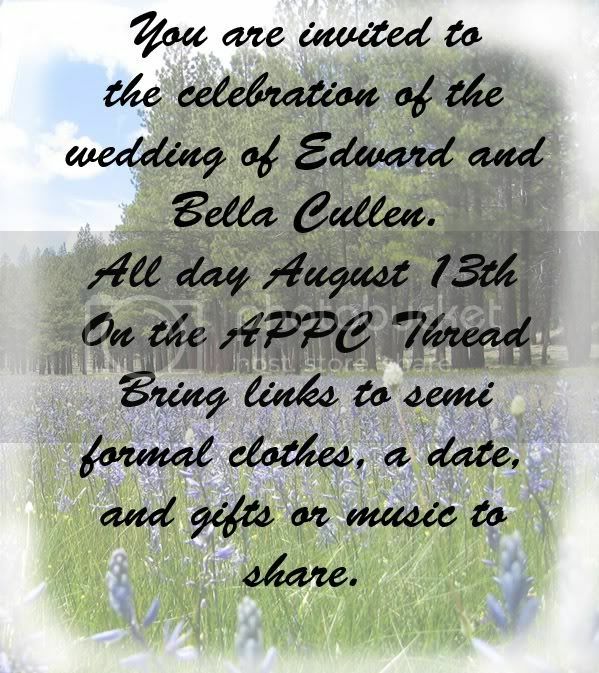 I would like to invite you guys to come to the Alice's Party Planning Committee Thread for an anniversary celebration in honor of Edward and Bella's Wedding! Here is your official Invitation! Please join us for some fun! *tiptoes over to Bri and sprinkles the Nerds all over her* Don't get inbetween me and my M&M's...have you ever tried the pretzel ones? Those are the kind I was eating last night (that is, until you stole them ) and they are DELICIOUS! I wouldn't mind if the entire saga revolved around Emmett, but if I have to pick one book then...Breaking Dawn. I know he was in that a lot already, but if we could have followed Emmett breaking houses with Rose and getting excited to fight and coming up with innuendos and since Bella was with them for a short while everything was absolutely perfect so Emm would have been even happier and funnier than he has been in the rest of the series (though he is always happy/funny, this would just be like happy/funny to the next level). His spirits would be high and I love reading about him when he's like that! Which luckily, he usually is. In all of the other books the climax is pretty serious and life threatening (New Moon and Twilight especially) so he would have to be somewhat serious and focus on that. Ad Twilight he would be consoling Edward most of the time, pretty much the same thing as New Moon. Well he would be thinking of Edward in the back of his mind 24/7 so he wouldn't be able to be as carefree as he normally is. Eclipse would be my 2nd choice, but Breaking Dawn wins out in the end because of the house breaking I'm a sucker for it! hmm... emmett hasn't been here yet. I thought he would hve been here allready. he's probably still teaseing edward and bella... that or hanging out with rose in her thread... Oh well! ohno. my laptop is dieing i will add it this once it gets re-charged. Okay, so I'm gonna jump right in here. Soooooooooooo, for everyone who doesn't know me, I'm Paige. I'm an 18yo Australian uni student. I love Emmett but more as the big bro I'll never have. Again I agree with what everyone has already said. Not sure if there's much to add really. Emmett loved Bella from the begining. And he (like any big bro) wanted Edward to be happy =) So I think that was mainly his reasons for Bell becoming a vamp. I also think he was excited to have someone new that he could PlayFIght against too. You know, with him being Emmett. What country/region would be Emmett's favorite to vacation to? Australia of course!! Other than Australia being full of awesomeness... I think Emmett would love Aus cause we have all types of weather and so many cool places and people. Although the food choices here are a bit limited... we don't have deer and mountain lion here . But i think i might be just a LITTLE biased! Something with action or comedy for sure! But I can see him liking pixar and disney too haha... TOY STORY FTW!!! nezziecarlycullen~ Im sorry, I haven't been here in so long that I've forgotten your nickname! What was it? And yes, Emmett was at the Rose thread earlier. He hasn't come by here yet, but if I remember correctly he was here along with Rose and even Esme I think, at the very beginning of this thread. So though I would LOVE it if he came again (hint hint) he usually can't visit the same thread twice within 100pages (aka one thread). Did that last sentence make any sense? Paige~ you don't have too much to catch up on, no worries the ruler of doom is a painful and shameful device (so I've witnessed, not experienced) instituted only when necessary, so basically when you don't follow the rules on EDC. For example, if your posts become to IM/chat-like or if they are non-relevant. Just try and either ask or answer a question about Emmett in every post, or at least keep the post mostly revolving around him in some other way and you will never have to face the Ruler of Doom! Does anybody know of Carrie's wherabouts? I've been posting frequently lately and want to see how far away I am from my next promotion! And I haven't done our promo dance (hammer time!!!) in so long...but more than anything I miss her! And I miss everybody else that's been MIA! Coooommeeee baaaaaccckkkk lovelies!! EDC needs to reunite! OC? New members? Whoever you are, come back!! that reminds me, is Jenni around anymore? And what about syd? I though I saw her on some other thread but not over here...cam and mez were on here with Emm at the beginning (Im pretty sure I saw their names while reading through), but I haven't seen them recently. what about kat? And Liz? Oops im thinking out loud again...just came back if you're EDC! Pleeeeaaaase!